I’ve been on the road a lot lately and, seeing so many roadworks and roundabouts on such trips, something my father used to say kept coming into my head. That was from a person who’d been involved in road-building himself in the 1950’s and who watched the Wicklow landscape changers of N11 and M11 develop over the years – ditches cut away, yellow dumpers climbing brown hills and the grey cement of bridges appearing on the horizon of newly-minted thoroughfares. Our route from Tinahely to Dun Laoighre on family visits in the 1960s, for example, changed from crossing the Dargle bridge and taking the beautifully-named (but very windy) Lucky Brook road to heading straight for the turn off into Cabinteely in the 1970s. But motorways are now taking over from their dual-carriageway precursors. Wexford is full of almost-open by-passes at the moment – New Ross, Enniscorthy – with new roads appearing out of what once were fields, red cones in rows signaling almost finished routes and road signs awaiting the removal of grey paint to direct us to the new short-cut locations. 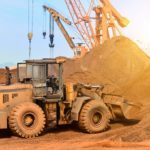 Going to Leixlip last week it was a 60kmh limit along the M7 where major work is taking place, flagged by signs that bore images of children in hard hats and the text – ‘drive slowly – my Dad works here’. The speed of such development was confusing my GPS, though – at least temporarily. It seemed to be running with the old layout initially, telling me several times that I was coming to a roundabout but no roundabouts exist there now. Fair dues to Ms Robotic Voice she changed tack within seconds to tell me to drive straight on. This was reassuring given that I was about to panic thinking I had to be in two lanes to the right of where I actually was at the time. I was in Laois and Offaly, too, to visit villages for the Farmers Journal ‘It Takes A Village’ series lately and found Portlaoise to be a great place for going round in circles i.e. on roundabouts. I also noticed how service stations off motorways have become hubs. Go to the Applegreen one in Coynes’ Cross or the Circle K in Carlow and they’re always busy whether you’re there at 11 o’clock in the morning or 11 o’clock at night. The Barack Obama Plaza near Moneygall in County Offaly was something else. The Saw Doctors were belting out a tune over the tannoy while people queued for food and fuel by the new time. In relation to motorways it’s interesting how much one’s attitude can change. Mine has, anyway. I used to steer clear of them as much as possible, a bit overwhelmed by the speed and afraid of making a mess of things. ‘I prefer rural roads’, I’d say, or insist that the scenic route was always better. My parents being in Naas General Hospital on several occasions forced me to get over the fear of motorways though. When parents are elderly you never know the minute you may need to get somewhere quickly and the motorway to Naas became my (reluctant) training ground initially but it had to be done. I moved, then, over time, from being a ‘heart-in-the-mouth Harriet’ kind of driver, hands gripping the steering wheel, frantically watching slip roads and almost having palpitations when overtaking a lorry so close to a cement barrier, to an ‘automatic-pilot Polly’ who takes it (almost) in her stride. While I still enjoy rural national routes and the scenery that goes with them – and there’s always a place for that kind of trip – if I am in work mode I find myself getting a bit impatient if the GPS takes a notion to bring me cross-country, down L for local roads. I breathe a sigh of relief when I’m back out on N roads again and no longer panic when I know that an M road is part of the trip home. I haven’t quite got to the stage of saying ‘yippee’ but I’m a lot closer than I was. The bottom line is, I suppose, that change has to be coped with even if it can put the frighteners on you at the start. What scares us first often turns out to be not too bad after all when we get used to it. Staying stuck int eh past isn’t an option. Motorways with wide central reservations such as the M50 cost €10 million per kilometre to build, I’m told, so the roundabout introductions in our county alone have meant huge State and EU investment aimed at getting us from a to b quicker and more safely. I’m also told that by 2050 10% of Irish people will live within 10 km of the motorway/dual carriage network – quite a feat – so they’re here to stay and travel (preferably by electric car in the future) to see one’s Granny in Galway or Auntie May in Limerick won’t be such a big deal. Yes, going round in circles (on roundabouts) is going to be even more a part of our reality. Safe travelling! 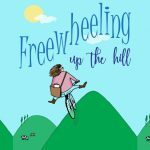 The book version of my poetry and prose collection Freewheeling Up The Hill is now available along with the e-book version on Amazon – links are to the right if you want a line up a laugh and possibly the odd heart-string twang. It has two road-related poems in it – one is called Nuts On The Road (after me seeing all those dreaded donuts on crossroads last summer) and another called Nutcracker Sweet about a sign I saw in Laois that said Caution – Squirrels Crossing. I just had to write a poem about that!